Renowned playwright, screenwriter and film director Israel Horovitz celebrates the release of his new book MY OLD LADY: Complete Stage Play and Screenplay with an Essay on Adaptation (Three Rooms Press) with a reading at Sawyer Free Library on Thursday, August 4 at 7pm. 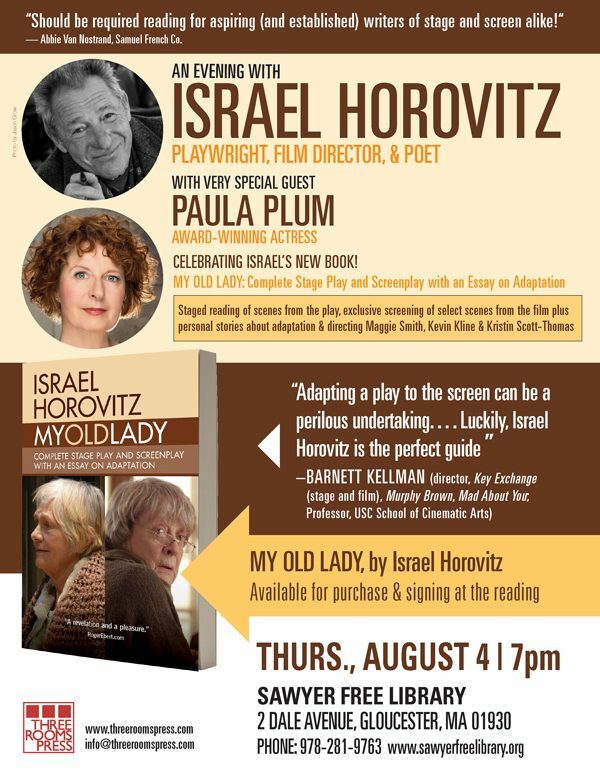 “An Evening with Israel Horovitz” will feature the award-winning author and very special guest, award-winning actress Paula Plum. The event will feature readings of scenes from the play, MY OLD LADY, exclusive screening of select scenes from the film adapted from the play, plus Horovitz’ personal stories about adaptation and directing the all-star film cast that included Maggie Smith, Kevin Kline, and Kristin Scott-Thomas. Playwright-screenwriter-director Israel Horovitz’s 70+ stage-plays have been translated and performed in as many as 30 languages, worldwide. His plays have introduced such actors as Al Pacino, John Cazale, Jill Clayburgh, Gérard Depardieu, and many others. He is also an award-winning screenwriter. His play, My Old Lady, starred Academy Award-winning actress Estelle Parsons in the lead role. At age 74, he directed the film adaptation of My Old Lady which starred Kevin Kline, Maggie Smith, and Kristin Scott Thomas. He lives in New York, Gloucester, MA, and London. Actress Paula Plum is is the recipient of five IRNE Awards, the 1995 Eliot Norton Award for Best Actress, the 2007 Eliot Norton Award for Best Actress , the 2004 Eliot Norton Award for Sustained Excellence, and the 2003 Distinguished Alumni Award from Boston University, among her many other accomplishments.